NASA and Russian space agency officials are breathing easier following the successful launch of three astronauts on a Soyuz rocket from Kazakhstan. 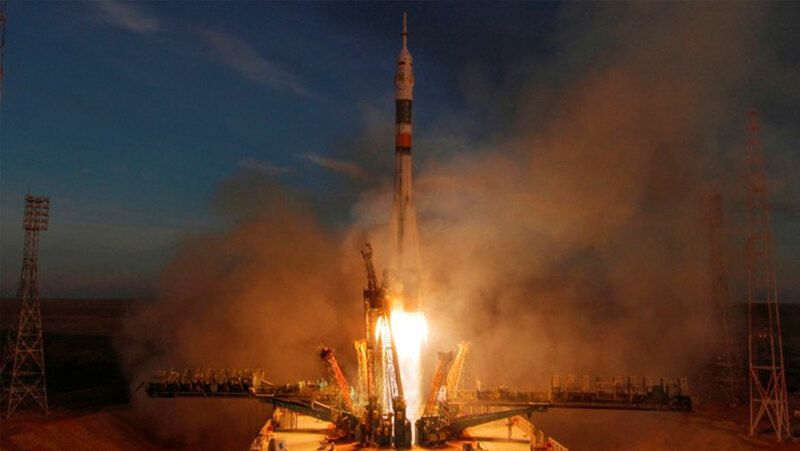 NASA's Anne McClain, Canada's David Saint-Jacques, and Russia's Oleg Kononenko blasted off from Baikonur at 17:31 local time (11:31 UTC, 6:31 EST), on December 3rd, 2018, kicking off a 6-hour, 4-orbit journey to the International Space Station. Hundreds of spectators and media representatives gathered to watch the launch here at the Baikonur Cosmodrome in Kazakhstan. The launch marks the first time a Canadian has flown into space since the wild public-relations success of Chris Hadfield, who commanded the ISS in 2013, and ran a scientifically productive mission while playing the guitar, chatting with celebrities and accumulating thousands of followers on Twitter. This is the first crewed Soyuz launch since a dramatic abort in October 2018 forced an emergency landing for two space travelers. It was particularly troubling considering the fact that the Soyuz is currently the only spacecraft and rocket that can take humans to space, since the end of the space shuttle program in 2011. NASA hopes that SpaceX and Boeing will change that when their human-rated space launch systems come online in the future. "I personally have 100 percent faith in that commission, they have a very long history of safe spaceflight," said Anne McClain, a NASA astronaut preparing for her first spaceflight, during a news conference. "I trust them just as I trust the people here at NASA. They will figure it out, and they will not let an unsafe vehicle fly." The view from inside the capsule showed the astronauts stone-faced in their white spacesuits, waiting for the countdown. A plush raccoon hung over one of their heads; the toy was brought to serve as a “zero-gravity indicator,” and show the crew, who were tightly secured to their seats, when the capsule reached weightlessness. The capsule, perched atop a rocket, lifted off at about 6:31 a.m. ET, timed precisely for a long-distance alignment between the cosmodrome and the space station. About 10 minutes later, the crew was safely in orbit. The latest launch was closely scrutinized because of the aborted mission to the ISS on October 11, 2018, which ended two minutes after take-off, when a rocket failure forced the two-man crew to perform an emergency landing. Some Russian investigators blamed the malfunction, which occurred as the first and second stages of a booster rocket separated, on a damaged sensor. The crew repeatedly denied being nervous about flying and insisted on the fact that the two-man crew had safely returned to Earth despite the dramatic mishap had demonstrated the reliability of the rocket’s safety mechanisms. The arriving astronauts will be greeted by three crewmembers who have been at the space station since June 8 - i.e., European astronaut, Alexander Gerst, NASA astronaut, Serena Auñón-Chancellor, and Russian cosmonaut, Sergey Prokopyev. Gerst was able to see the Soyuz MS-11 spacecraft from the station as the spacecraft launched into orbit. At the time, the space station was flying about 252 miles above northeastern China. They are due to fly back to the Earth on December 20, 2018. But, once Kononenko, McClain, and Saint-Jacques arrive at the orbiting laboratory, they will not have much leisure time — the space station crew has a packed schedule for the next couple of weeks. On December 4th, a SpaceX Dragon capsule loaded with tons of supplies will blast off, arriving two days after that. On December 11th, Kononenko and his Russian colleague, Prokopyev, will perform a spacewalk, scheduled to last about 6 hours. Finally, on December 19th, Gerst, Auñón-Chancellor, and Prokopyev will pack up and head home, leaving the new crew in their stead.